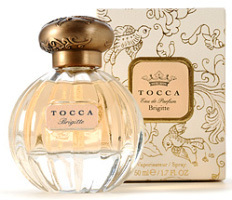 ...Tocca's newest perfume is rich with the intoxicating scent of the spice market in Marseille, the aroma of Ginger and the baskets filled with Rose petals pervading the air. Additional fragrance notes include rhubarb, papaya, iris, saffron, pannetone, sandalwood and musk. Is pannetone the new crème brûlée, then? Actually, snarkiness aside, I do rather like the sound of this – though saffron always gives me pause. or make sure that a hefty sum is payed to BB's favourite charity and there is absolutely no component in there that harms the animals (The Baby Seals OMG!!) in any way. Has there been a rash of pannetone accords lately? I missed it! I have not loved any of the other Tocca scents either, although I did like the original Stella body lotion. You might be right about lawsuit material! I want a Tocca bottle so badly, it infuriates me that I can't like any of the scents. Perhaps we could persuade them to sell their bottle design to, say, le Labo, or Parfumerie Generale? Not that I know of, R; just thinking that this may be in the vanguard of a rush, so to speak. I like the Tocca scents even though I don't own any of them. This sounds really sweet and I'm not sure I'll like it. But, I do wonder about a lawsuit too. This isn't just “inspired” by BB, it is named after her. Madame BB gets fined a lot maybe she needs the dough. I think that Tocca bottles are pretty cute! I am not a huge fan of their scents but the bottles are cute. I just sampled this and reviewed it on my blog today–it's not my cup o' tea. Waaaaay too sweet in the drydown, and I'm not diametrically opposed to all sweet scents, but I couldn't handle this one. Drat that pannetone accord! Too bad, but about what I expected. I Know i will be on the Vanguard here and it's just my nature… but i think so far the Tocca scents have been really well done, the First one , Tocca Touch, especially makes me think of my sister who passed over a year ago… smells like something she would wear all the time… and i must say all the other ones have hit the right chord with me… I do love a Sweet Fragrance at times… and Cleopatra was INCREDIBLY well done with Grapefruit and Cucumber, Musk, Vanilla and Tuberose! Very Sensual and Clean! so, from the sounds of it, nothing i find at all disagreeable about Brigitte! Can't wait to smell it! Yup – not sure that associations with Brigitte Bardot is great publicity at this point. I wouldn't say they're badly done, just not to my taste at all. I thought the Stella lotion was great — wish they'd done a perfume like it (the Stella perfume was very different). I tried this one last week – it was very nice, although the lasting power was not great. I would buy it if I didn't already have so many bottles of perfume that this one would get lost in the crowd – it's not quite distinctive enough to make me reach for it amongst so many other great scents. Is it really very gingery? If so, I'll have to give it a shot.